What is a crocodile fern? Native to Australia, crocodile fern (Microsorium musifolium ‘Crocydyllus’), sometimes known as crocodyllus fern, is an unusual plant with wrinkled, puckery leaves. The light green, segmented leaves are marked with dark green veins. Although the distinctive texture has been compared to a crocodile’s hide, the crocodile fern plant actually has a graceful, delicate appearance. What is a crocodile fern? Crocodile fern plant is a tropical fern suitable for growing outdoors only in the temperate climates of USDA plant hardiness zones 10 and 11 (and sometimes 9, with protection). 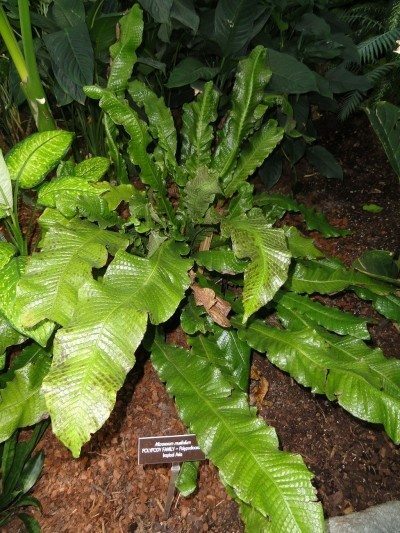 Grow crocodile fern indoors if your climate has even a possibility of winter frost; chilly temps will kill the plant in a hurry. At maturity, crocodile fern reaches heights of 2 to 5 feet with a similar width. Although the broad green leaves appear to arise directly from the soil, the fronds actually grow from rhizomes that grow just under the surface. Growing crocodile ferns requires a bit more attention than your average houseplant, but crocodile fern care really isn’t involved or complicated. Crocodile ferns need regular water, but the plant won’t last long in soggy, poorly drained soil. A rich, well-drained potting soil such as a soil formulated for African violets works very well. To keep the plant happy, water whenever the surface of the potting mix feels slightly dry. Water until liquid drips through the drainage hole (always use a pot with a drainage hole! ), then let the pot drain thoroughly. A kitchen or bathroom is an ideal environment because crocodile ferns benefit from humidity. Otherwise, increase humidity by placing the pot on a tray or plate with a layer of wet pebbles, but never let the bottom of the pot stand in the water. Crocodile fern plants perform best in indirect or low light. A spot in front of a sunny window is too intense and may scorch the fronds. Cool to average room temperatures are fine, but avoid heating vents, drafts or air conditioners. To ensure your crocodyllus fern has adequate nutrients to keep it looking its best, provide a diluted water-soluble fertilizer or a special fern fertilizer once every month during spring and summer. Read the instructions carefully. Too much fertilizer won’t make your plant grow faster. In fact, it may kill the plant. Read more articles about Crocodile Ferns.